All countries evolve. A person born a generation ago in America has seen a revolution in social issues. In the last 50 years, the US has seen great strides in the acceptance of minorities, homosexuals, the physically and mentally handicapped, and those with mental illnesses. The military has gone from a noble profession, to something to be despised, to a 'love the soldier, hate the war' mentality. We've had the Red Scare, watched the Berlin Wall come down and had the first large-scale terrorist attack on American soil. All that, however, is nothing compared to what has been going on in China since the end of World War II, as seen in Xinran's Good Women of China. So much of it will never be know, because of China's strict control of the media. It's a wonder even that the Tank Man footage of the Tienanmen Square Massacre made it out intact, as military police stormed the hotels overlooking the Square, destroying any film and cameras they could find. By the 1980s, however, China began to give the appearance of a free press. 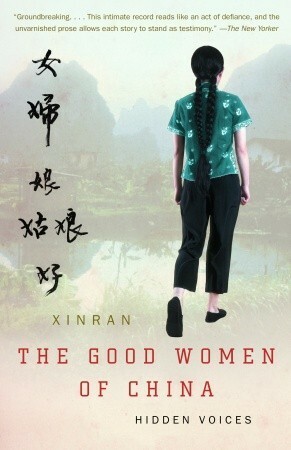 Author Xinran sought to give voice to the millions of women in China that had found themselves in truly horrifying situations. Created by a combination of thousands of years of a male-dominated culture, the huge social and political upheaval of the last century, and a pervasive national sense of not being able to change one's lot in life. Whatever the reason, though, there is no excuse for the horrors found in the stories included here. The very first story in the collection is the story of Hong Yue. Hong Yue was a bright young girl who kept a diary while in the hospital. But the relative safety of the hospital was the best situation she'd ever been in. For at home, her father slips into her bedroom at night. And when she tells her mother about this, she is told that there is nothing to be done about it. The family needs its patriarch, and there is nothing to be gained by making a fuss and the family losing face over the issue. So Hong Yue learns how to keep herself sickly and confined to the hospital, where befriending a baby housefly and sacrificing her health is better than the alternative. But not every heartbreaking story ends in despair. Due to the lack of rural infrastructure, a massive earthquake in central China went completely unnoticed by authorities. Until people walked through the destroyed roads leading out of town, no one outside the village knew how bad the destruction was. Entire apartment buildings were shorn in two, as mothers watched their children buried in rubble. But from the devastation of the earthquake grew an orphanage that helped the childless mothers as much as the orphans themselves. Their days are filled with laughter and play, and both the mothers and the children share in the healing. After working on her radio show for years, Xinran became a tremendously famous media personality in China. It came to the point where she would be stopped on the street by perfect strangers, and being offered their terrible stories, wherever she went. Eventually, it became too much for her, and she moved herself and her son to Britain. One good thing came of the move, however - outside of the influence of the Chinese media, she's now able to get her books published. Since then, she has also set up a charity teaching Chinese heritage to children who have been adopted out of the country. In this way, Xinran continues to help those without a voice, both in China and beyond. Highs: These are stories that need to be told, no matter how hard they are to endure. Lows: Because there are no easy answers to the plights of those whose stories are told, it does leave the reader with a sense of despair at the end. Verdict: An absolute must-read for anyone who wants to know how the rest of the world really lives. This was a great review! I absolutely loved this book, but I completely agree with you about the "Low."